Hydroseeding is becoming a popular means of planting grass due to its relative ease of use and effectiveness. Hydroseeding is a process by which seed, water, fertilizer, fiber mulch, and sometimes lime are blended together in a tank and applied onto a prepared lawn area through a spraying hose. 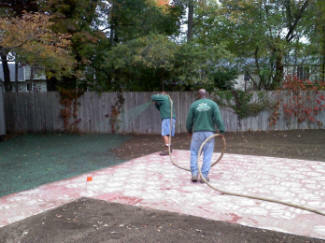 If you are planting a relatively large area, hydroseeding can be completed in a very short period of time. Hydroseeding can be very effective for hillsides and sloping lawns to help with erosion control and quick planting. Hydroseeding will typically cost less than planting with sod, but more than regular seeding. Results are often quick with high germination rates producing grass growth in about a week and mowing maintenance beginning around 3-4 weeks from the date of application. Fiber mulch accelerates the growing process by maintaining moisture around the seeds thereby increasing the rate of germination.